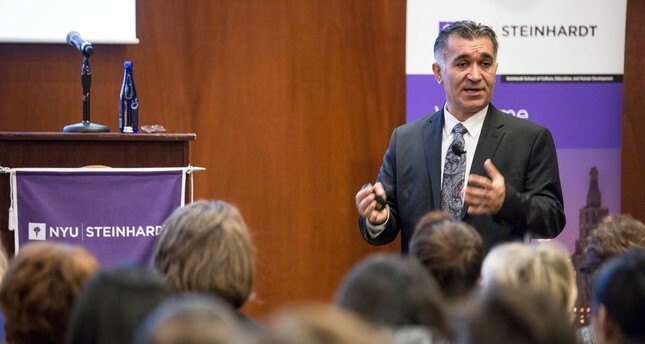 A Turkish academic in New York University has been honored for his research which can help refugee children perform better at school. Speaking to Anadolu Agency in a Skype interview, Selçuk Şirin said that he aims to create an online game-based platform which can be used as a teaching aid for refugee children. Şirin said children who suffer from post-traumatic stress disorder need innovative methods of teaching. "Developing a play-based learning system platform could be one of the ways to educate such children," he added. His research team is now working on a project named "Hope," an online platform that will serve 100,000 refugee children and the poor in the coming five years. Project Hope is believed to be effective and cost-efficient to provide refugee children with the sought skills of language and cognition. The scholar, who is a professor in Applied Psychology at the Steinhardt School of Culture, Education, and Human Development at New York University, has also written the first-of-its-kind book "Muslim American Youth" after the 9/11 attacks. He will receive the Klaus J. Jacobs Award on Nov. 30 for his research on American Muslim youth, refugee children and Syrian refugees. Hailing Turkey for being on the frontline on accommodating refugees, he lamented how children miss out on school because of wars and conflict. "Most of the [refugee] children do not get the chance to get a formal education because they are forced to flee their country due to civil war," he said. Turkey hosts some 3.5 million Syrians, more than any other country in the world. Ankara says it has spent around $25 billion helping and sheltering refugees since the beginning of the Syrian civil war.